So. You are keen to get out there and do some observing. The stars are out. But which is which? When you are a beginner, there’s a lot to learn in a short time. But you don’t have to go it alone – we’re here to help. This page will get you started. Even so, the only way you can really do it is to go out and see for yourself. It may be April but it can get pretty cold out there, so put your coat on. We don’t want frozen Young Astronomers on our hands. And knowing that some of our readers are Old Astronomers, this applies to them, too. The more comfortable you are, the better you will enjoy stargazing. Who cares what you look like – no one can see you. And a bobble hat helps, too. A hoodie? That’s up to you, as long as the hood doesn’t cover your eyes when you look up…. All maps produced using Stellarium software. Now don’t write in and tell us that we have the points of the compass all wrong. This is a map of the sky, so you have to hold it over your head. When you do this, east and west will be the right way round. It shows the whole sky, so the scale is quite small. Normally you turn to see different parts of it, so to see the view looking north, for example, hold the map upside down with north at the bottom. It is shown for the UK, but will also work fairly well for Europe and North America. 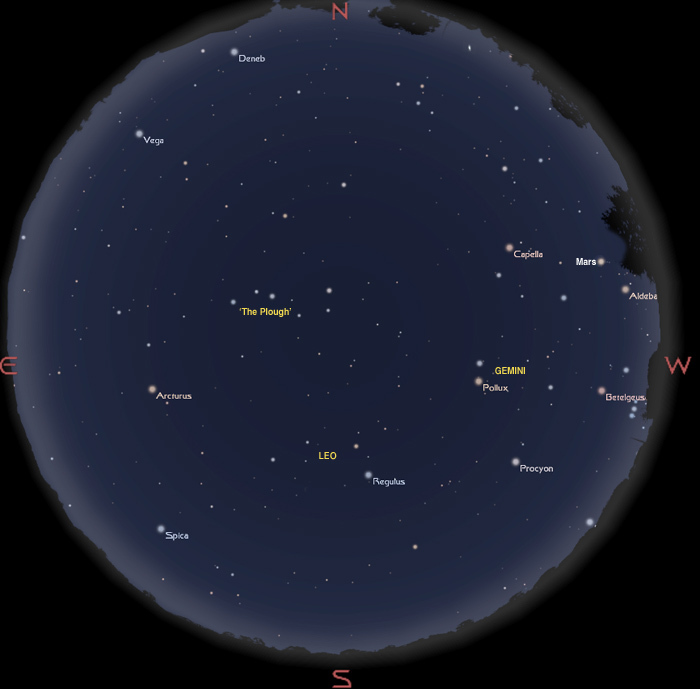 The map shows the sky in mid month at about 10 pm, at the start of the month at 11 pm, or by the end of the month at 9 pm, though by then it will be too light to see much at that time. Anyone would think it was summer. All times are British Summer Time. TIP If you aren’t sure of the direction of north from your location, click here for a page on Getting Your Bearings. If it all looks just like a lot of dots, rather than the load of odd animals and bits of human beings that some sky maps show, here’s the way to get to grips with the sky. Start with something familiar and work from there. Most people recognise the seven stars that in the UK we call the Plough and in the US is called the Big Dipper. If you can’t find it, it’s because you aren’t looking high enough – it’s almost above your head at this time of year, so it’s shown at the centre of this map. 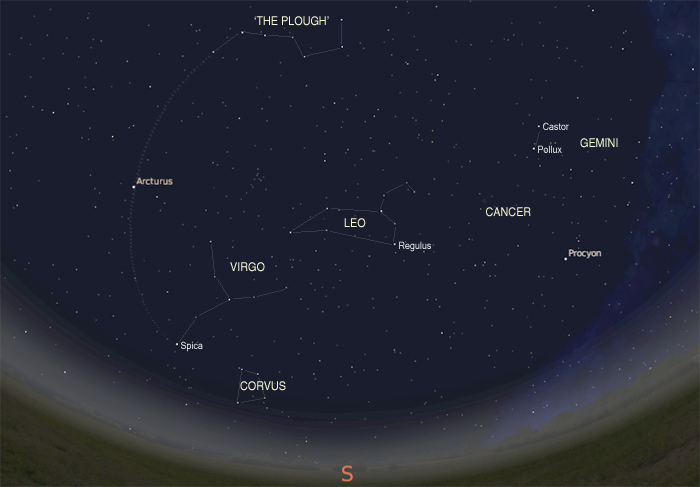 Look below the Plough, about halfway between there and the horizon, and you will see a group of stars called Leo. Now use the map below to find more patterns nearby, but don’t expect to see those convenient lines helping you to see the patterns. If you do see them, consult an optician or give back those glasses your friends gave you on 1 April. Leo is the main constellation in this part of the sky, and it’s very recognisable. There are some nice groups of galaxies in it which you can find with a telescope, so click here to find out more. Above and to the right of Leo are two bright stars, called Castor and Pollux. These are the main stars of Gemini, the Twins. Click to find out more about these stars and the constellation. Between Leo and Gemini, and quite hard to see on this map, is the constellation of Cancer. To find out more about this famous but usually rather secretive bit of sky, click here. Lower down and to the left of Leo is Virgo with its bright star Spica. Jupiter is also there this year, above Spica and a lot brighter, so that’s the best guide to finding this constellation.Another way to find Spica is to go up to the Plough and follow the curve of its handle round. First you come to a very bright star, Arcturus, and then you come to Spica, which is a lot lower in the sky. On the map is marked a sort of Y shape, which is quite easy to pick out, which helps you to spot Virgo. If you want a map with all the constellation names on it, click here. There’s just one planet around during the evening this month, and that’s Mars. You can see it over to the west, just above the red star Aldebaran in Taurus. Mars is also reddish, of course, but slightly fainter. These two red objects are higher up earlier in the evening, but in the twilight, because our map is shown for a time when it is almost fully dark, about 90 minutes after sunset. Mars is now quite a long way from Earth, and getting more distant all the time, so if you get to look at it through a telescope, probably all you’ll see is a tiny disc, with no markings visible. You’ll have to wait until autumn 2020 to get a good view. Jupiter and Saturn are in the early morning sky at the moment, quite close together down in the south before dawn. They will be in the evening sky during the summer months so will be easier to observe then. Mercury and Venus are too close to the Sun to be seen from the UK. Around 22 April you should look out for few meteors – shooting stars. The annual Lyrid meteor shower is then at its maximum, but this year the event coincides with a waning Moon which rises about 11 pm. This will brighten the sky somewhat, but if you observe early in the evening you should still see some meteors despite the Moon. Even when it it’s in the sky you can still see meteors if you keep the Moon behind you. There are only likely to be around 15 meteors an hour even under ideal conditions, which in practice never actually applies, so don’t expect anything spectacular. They will appear to come from the general direction of Vega, over to the top left of the map at the top of the page. Others could appear, which are not part of this shower. For more details, see our Meteor Section page on the shower. We have a whole section of the website devoted to the Moon and its features. OK, you’ve read all this for nothing, now comes the plug. This page is brought to you by the Society for Popular Astronomy, which is a really great society to join. It’s based in the UK but there are members in other countries as well. It doesn’t cost much to join, and there is a special rate for Young Stargazers. At least take a look at what we have to offer.